This is post two of three for the 2017 Dopey Challenge. Checkout my recap for the expo, 5k, and 10k here. So this was the weird day of this year’s Walt Disney World Marathon Weekend. We’d been watching the weather all week and knew it was going to be rainy. I don’t mind running in the rain if it’s not too cold, but thunderstorms were in the forecast, which…is a problem. runDisney had been sending out tweets that they were monitoring the forecast and would make a decision accordingly. We all had our fingers crossed that the thunderstorms would miss us or the timing would work out. Unfortunately, at around 7:30 on Friday night, runDisney put up a post on Facebook stating “out of an abundance of caution” they were deciding to cancel the half marathon. I was shocked. As far as I know, they’ve never had to cancel a race before and it felt really early to be making that call. I understood their decision, but I didn’t have to like it! I was literally snapping this Flat Amy pic when I got the cancelation notification! Everyone was bummed. Twitter and Facebook immediately went crazy with people reacting. In the end, runDisney made the right decision. 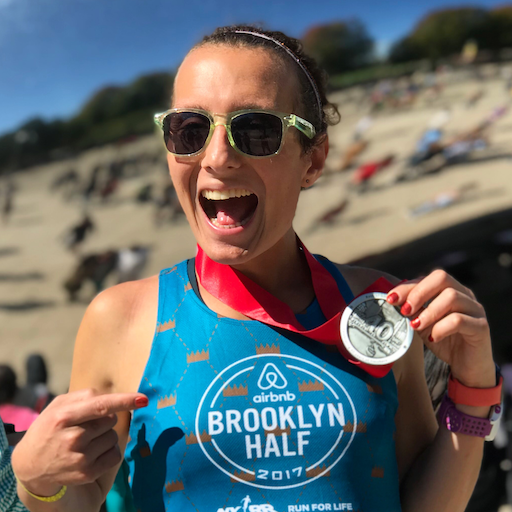 They had to think of the fact that they wouldn’t be able to evacuate all of the runners from the course if there was lightning in the area and also about their volunteers setting up throughout the night. As it turned out, it did lightning in the area throughout the night and continued well into the morning. It was the right call. I have to give runDisney a lot of credit for how generous they were. 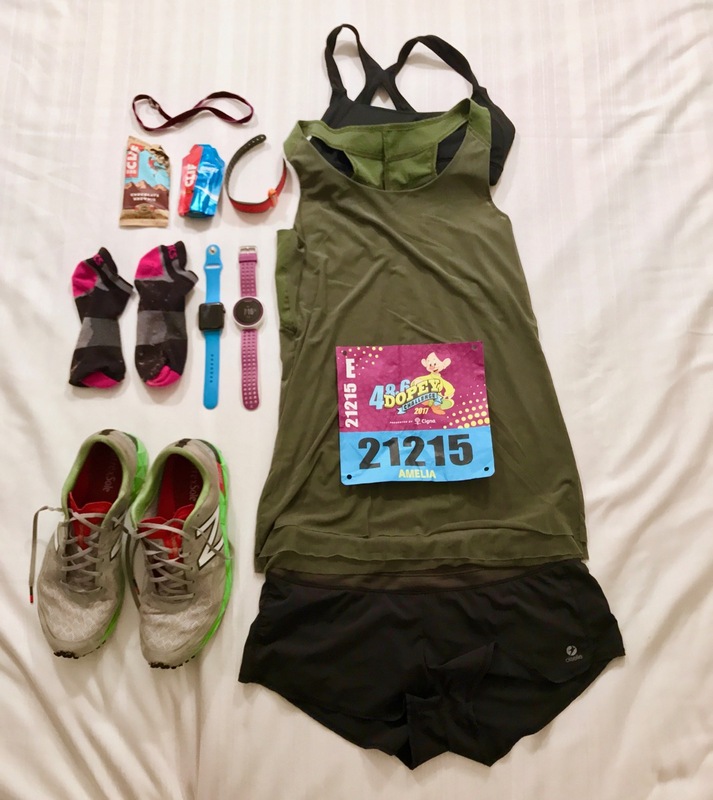 Runners were offered refunds in the form of Disney gift cards, park tickets, entry into another runDisney race, or the option to run the full marathon the next day. Surprisingly 1,500 runners took that option! Dopey and Goofy runners are getting automatic refunds via electronic gift cards. And everyone got/gets their medals. Still, many of us came to run and I didn’t feel right taking a medal for a race I didn’t run or taking Dopey and Goofy medals when I didn’t do the full challenge. This where things actually started to get fun. People started making all kinds of plans to run on their own. Some woke up at the same time they would have otherwise, others opted for a little extra sleep first. At first, doing laps around resorts sounded like it was going to be kinda miserable, but I’m stubborn and wanted to take part. The half was the one race Danielle was planning on running so she still wanted to run too. We slept into just a little since we could and then got out there for our own half marathon. We were staying at the Yacht Club which is one of the Crescent Lake resorts so pulling this off was really easy. We did laps around the Boardwalk and out and back to Hollywood Studios. Each lap was just about 2 miles and quite scenic. When we got outside, there were already a bunch of other runners and the number of them just kept increasing throughout our run. Many even had their bibs on! It was amazing and there was so much camaraderie among everyone. Having that many people out there running at the same time almost made it feel like it was still a race! Some people even came out to cheer! At other resorts, people started setting up water and aid stops for runners. Throughout the run, there was lightning that we could see in the distance, but it was never right over us. The good thing about where we were running was we had shelter most of the way that we could have ducked into if we needed. 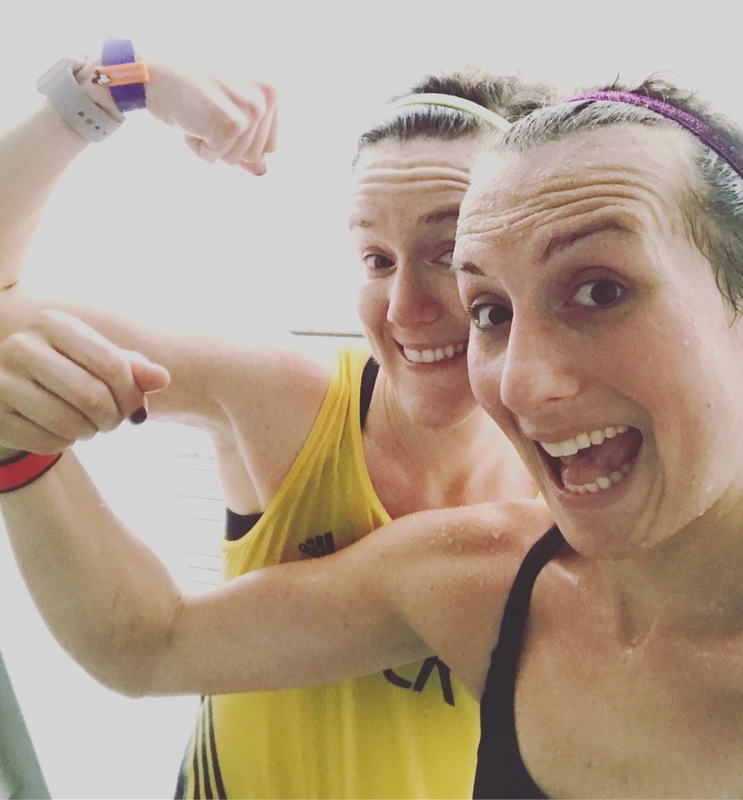 The rain held out for most of our run until about ten miles in, but it was so humid and warm out that it felt great! At one point, we got a pretty decent downpour going and it was probably my favorite thing ever! Figured that the day that was 70º in the morning was the day the race got canceled. 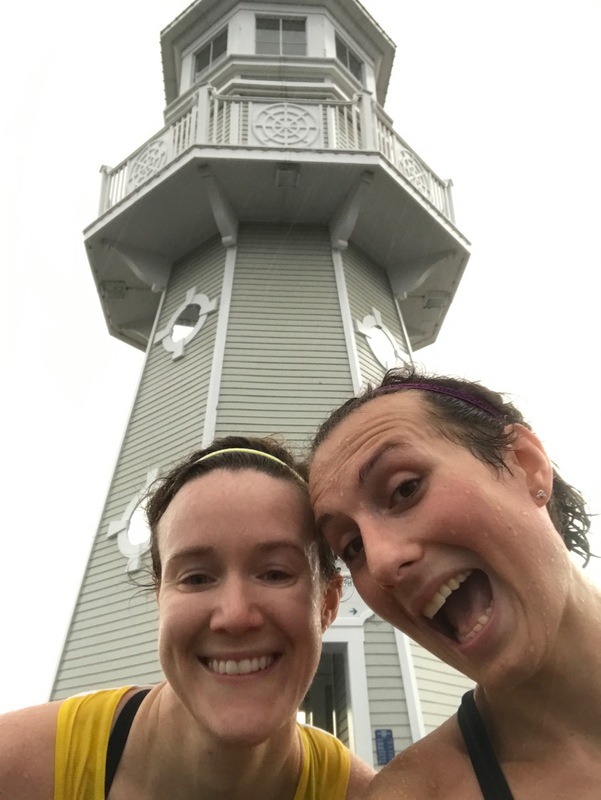 We ended up doing our DIY half marathon in 2:00:29 and finished right at the lighthouse with huge smiles on our faces! It was an incredible experience, possibly even more fun than the actual race would have been. I’m so glad we decided to go out there and do it. By the time we were done, I had a huge smile and zero disappointment about the race being canceled. All done! We perfectly nailed it so we finished exactly here.